A mum who returned to university to pursue a career in construction has secured her dream job and seen her designs become reality as part of prestigious project in her home town. Nichola Hilton, from Colwyn Bay, studied a BSc (Hons) in Architectural Design Technology at Wrexham Glyndŵr University after making the decision to return to study fourteen years after leaving school to help develop her career. She is now working for a construction company in nearby Llandudno Junction and is urging anyone considering returning to university to follow her example – and their dreams. A single mum of four, Nichola said despite the initial apprehensions about returning to university, the decision turned out to “life-changing” and one of the best she has ever made. 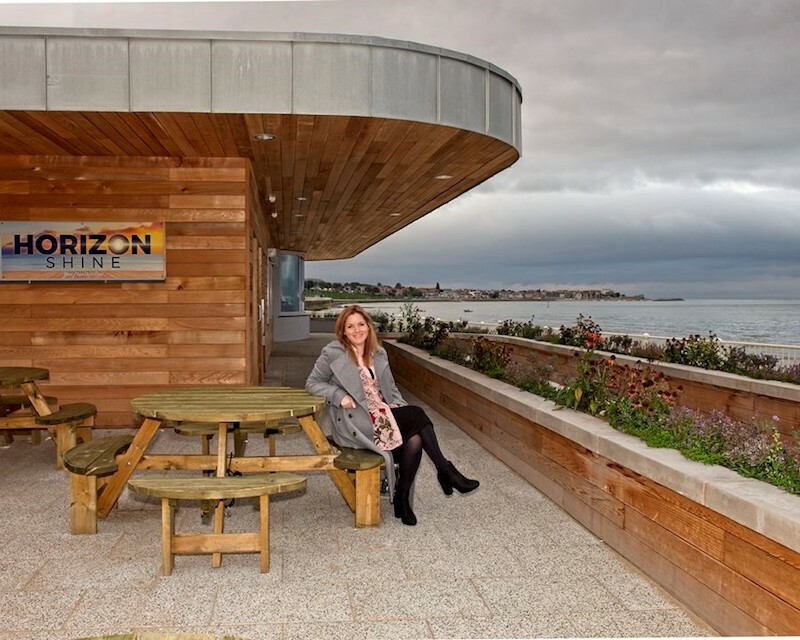 During her second year at the university, a university assignment to work on a project for Conwy Country Borough Council saw Nichola’s designs translated into reality, when her proposals for a new concessions unit were selected by the council to be built. The unit formed part of the Colwyn Bay Waterfront Project, a major redevelopment of the town’s seafront. “Throughout our degree, we were taught to treat each assignment as a ‘live project’ with client meetings, masterplans, presentations, and so on,” explained Nichola. “That meant that when the opportunity came to work on a real ‘live project’ with the council arose, all the practice and experience came in to practice. Nichola prepared a series of designs and proposals which she submitted to the council – both as part of her university assignment and as a live project. She added: “We were always told that there was no guarantee that the council would pick one of our designs. However, after our presentations they decided to put three of our designs on to a shortlist. I was ecstatic. “From what I remember, it was a long wait until I was told they had chosen my design. Knowing that it had been chosen was an amazing feeling, and gave me so much confidence and pride. “Now my design is a real building I drive past, it’s brilliant. It’s something I am still getting used to and will probably never tire of to be honest! The project ultimately proved such a success that it was nominated for a major industry accolade in the Construction Excellence in Wales awards. Despite being pipped to the post by another development, judges singled out Nichola’s work for special recognition in honour of the impact it had on her career. Nichola is now working for Beech Developments (NW) Ltd, Llandudno Junction, as an Assistant Architectural Technician for the past year. She added: “I have found a great employer who are extremely supportive towards my career progression. Senior lecturer in the Built Environment at Wrexham Glyndŵr University, Dr Colin Stuhlfelder, said: “Our courses are designed to ensure that students get the kind of practical experience they will need in their chosen career. “Treating projects as live helps equip students with the skills they will need in their chosen career – and it certainly worked in Nichola’s case. “I’m so glad that coming to Glyndŵr helped Nichola to build her confidence and develop her skills. Find out more about Wrexham Glyndŵr University’s BSc (Hons) Architectural Design and Technology degree here.